Sad. Lifeless. Limp. But BLONDE. These are the words to describe those sections of my hair that I highlighted last fall. 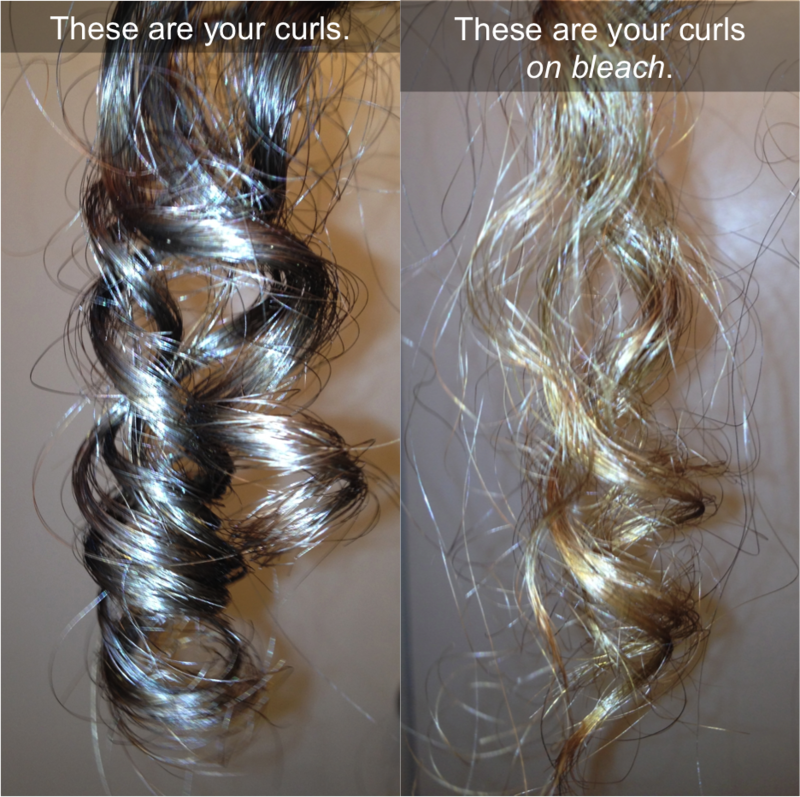 We all know, we’re always told, that bleach kills your curls, but many of us do it anyway because of the way the color makes our curls pop. I’m definitely guilty. When I get bored with my hair, I either cut or color, and you can only cut but so much and still have hair. So when I can’t fight the mighty light (color), here’s what I do to beat the bleach. First, let’s look at how bleach actually affects hair (I did some research on this one). 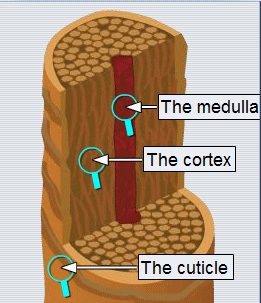 When bleach comes into contact with the hair shaft, it causes causes the protective cuticle scales to lift and separate, allowing the chemical to enter the cortex and remove pigment. The longer you leave bleach on your hair, the more your cuticle is lifted, and the more pigment is removed. This causes hair to become more porous, and the cuticle is no longer able to do its job and lock moisture in. That’s why hair becomes so dry and brittle after using bleach. Curly hair is already more porous (and dryer) than straight hair, so the process is even more damaging to curly locks, and it’s irreversible. But it looks good! 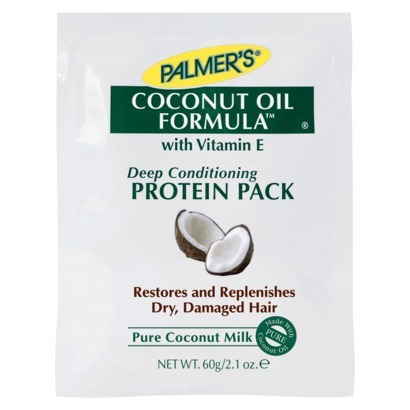 Palmer’s Coconut Oil Formula Deep Conditioning Protein Pack. I used this 1-2 times per month, in addition to my hot oil treatments, which I’ll discuss in a minute. I use this product because 1) I trust the Palmer’s brand, 2) it’s affordable, and 3) my hair loves coconut oil. It only costs $2-$3 a pack, and with the amount of hair I have, I use two at a time. There are a ton of other protein treatments out there, ranging from ApHogee reconstructive treatment for severely damaged hair (I haven’t tried this yet, but I hear good things about it, with the exception of the smell), to all-natural egg or avocado mixtures (there are many, many recipes on the web). The point is, put protein back in your hair – regularly! We’ve already discussed how bleached hair is unable to retain moisture because of the lifted cuticle, so we’ve got to lend our hair a hand. The only true moisturizer is water, which curly hair tries to grab from the air (hello frizz), but we can help it by coating our strands with a nutrient-rich, natural oil that strengthens hair and helps prevent water from escaping. 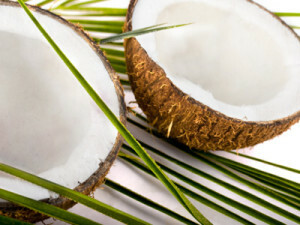 My hands-down favorite hot oil treatment is done with coconut oil. Its small molecular structure allows the fatty acids and vitamins to penetrate the hair shaft so your hair can absorb all the goodness (can you tell I’ve been studying this?). My second favorite oil to use is extra virgin olive oil; it’s just as good on your hair as it is in your body. From experience, most of us know that the ends of the hair are the oldest, most fragile, and most prone to breakage. Split or thinning ends will ruin your curls, so they must be protected like the life of your hair depends on it (well, it does). I always put extra moisturizer and oil on my ends, I NEVER brush my hair in its dry curly state, and I ALWAYS re-moisturize my ends at night and tuck them away in a pineapple or loose bun. I’m a lot more relaxed about this when I don’t have highlights, but when I do, I’m militant! Those are my basic bleach-battling techniques. What are yours? Awesome info! I highlighted my hair years ago and kept it up for a few years before getting frustrated with how frizzy and dry it was. Wish I had these tips back then! Thanks! These treatments make a world of difference for me. p.s. The 12 yr. old has already had color in her hair! What do you use to add moisture in your hair at night? Usually water with a bit of leave-in.